Chancellor George Osborne has announced a new initiative that will explore the potential role of cryptocurrencies in Britain’s economy. 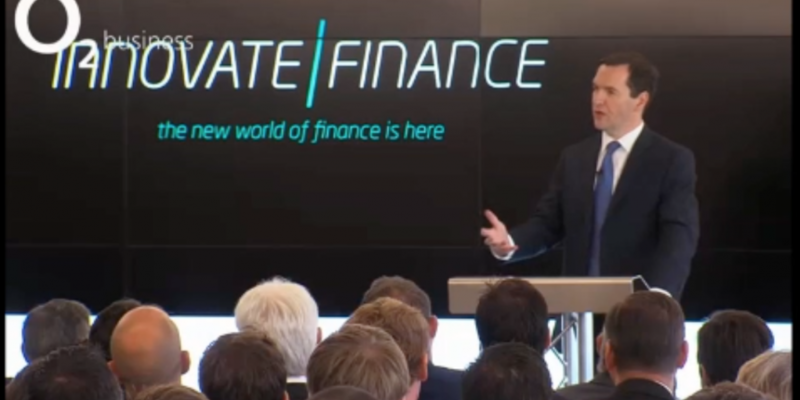 “These alternative payment systems are popular as they are quick, cheap and convenient […] I want to see if we can make more use of them for the benefit of the UK economy,” he said during his speech at the launch of Innovate Finance, formerly FinTech UK, a group that promotes the interests of the UK FinTech industry. Backed by the City of London Corporation and Canary Wharf Group, the trade organisation aims to be a hub for industry influencers, regulators, tech and talent. Speaking at the London conference, Osborne outlined a series of proposals that aim to foster financial innovation and establish the UK as a market leader in the FinTech sector. He said the key to the government’s long term economic plan is “cementing Britain’s position as the centre of global finance”. He went on to say it is an exciting time for those wishing to drive innovation in the financial services industry. “The UK’s offshore jurisdictions are already strong supporters of alternative currencies and, by bringing together a common approach, this could position the UK as one of the leading centres for digital currency innovation,” Hamblin added. This morning, Osborne also attended a demonstration of a Robocoin ATM operated by Cointrader.net and purchased an undisclosed amount of bitcoin. According to spectators, the Chancellor greeted the demonstration with great enthusiasm. Hugh Halford-Thompson, head of UK operations at Cointrader.net, described the purchase as a “great step” towards bitcoin’s political and regulatory acceptance. London is one of the biggest financial hubs in the world and is, by far, the biggest financial centre in Europe. The government’s position on cryptocurrencies has been somewhat ambiguous, although the UK has managed to attract a number of bitcoin businesses. Besides HMRC’s tax guidance, there has been little in the way of a comprehensive regulatory initiative. In June, the UK’s Financial Conduct Authority (FCA) announced a project dubbed Project Innovate with the aim of ensuring “positive developments”, such as bitcoin, are supported in the region. A representative from the FCA said the regulatory agency has yet to determine its stance on digital currencies.